One of the more vivid Easter processions is the Processó del Silenci (Procesión del Silencio, Silent Procession), held in complete silence and solemnity, with the quietness only broken by a deep and throbbing drumbeat. Dijous Sant (Jueves Santo, Maundy Thursday) marks the last day of Quaresma (Lent). 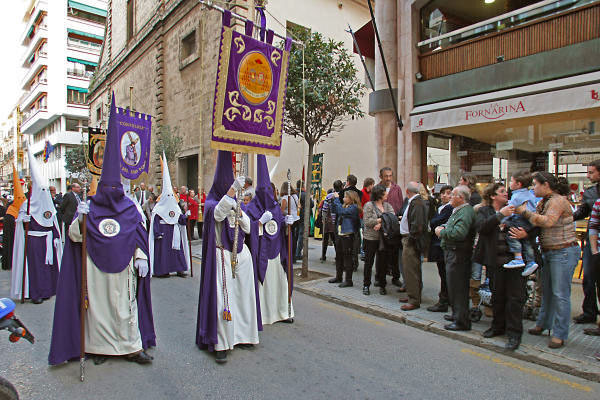 On this day, the annual Processó de la Sang, the largest of the Easter processions, is held with hundreds of hooded penitents participating, and thousands of believers in utter repentance in Palma. Visually, it is all quite stunning. In the past, a stringent regimen of fasting meant that the eating of sweets or meat was not allowed during Lent. After Viernes Santo (Good Friday), Robiols (sweet pies), Panades (savoury pastries), Crespells (sweet biscuits) and Coques de Patata (see photo above) are prepared for the festive weekend. The Golgatha celebration (Passion of Christ) in Mallorca is a pageant centred around the Davallament, the story of the Last Supper, the betrayal of Jesus by Judas, Jesus’s capture, his crucifixion, the taking off of the cross, the Pietà and, finally, the Enterrament (burial). Davallament performances are usually staged in Felanitx, Artà, Sant Joan and Pollença. On Easter Sunday, most Mallorcan pueblos and parishes celebrate the resurrection of Christ and the Encontrada between the Virgin Mary and her son, Jesus. This is a joyful procession, now without hoods or cloaks, where brass music is played by the Banda de Música and when pigeons are released en masse to celebrate the happy occasion. A Missa Solemne (solemn mass service) is usually celebrated after the Encontrada, concluding the religious part of Easter and Setmana Santa for another year. 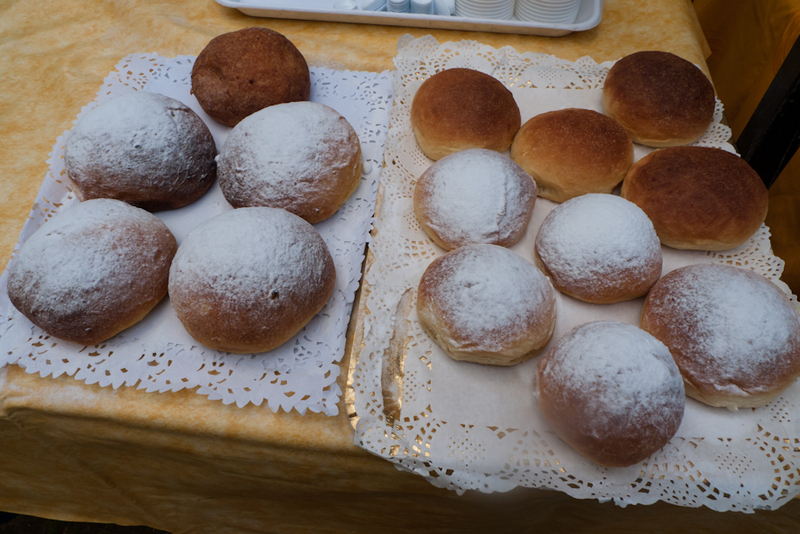 Easter Monday is not traditionally a church holiday in Spain, but has acquired holiday status in recent years to allow for the celebration of Pancaritats. In Mallorca, this is a tradition involving citizens convening at monasteries and hermitages to share food with one another and with other, less privileged members of the local community. In Felanitx, a Pujada Solidaria journey on foot is organised up to Sant Salvador, the nearest Puig to Felanitx and the seat of the Santuari de Sant Salvador, the monastery dating from the 15th century. On the Sunday after Easter, Diumenge de l’Àngel will be celebrated in many Mallorcan pueblos and at Palma’s Castell del Bellver with church services of the more formal kind and with further festive gatherings. More food to be shared between all, no doubt. A schedule of most of the dates and venues of religious Easter ceremonies in Mallorca can be found on this website. 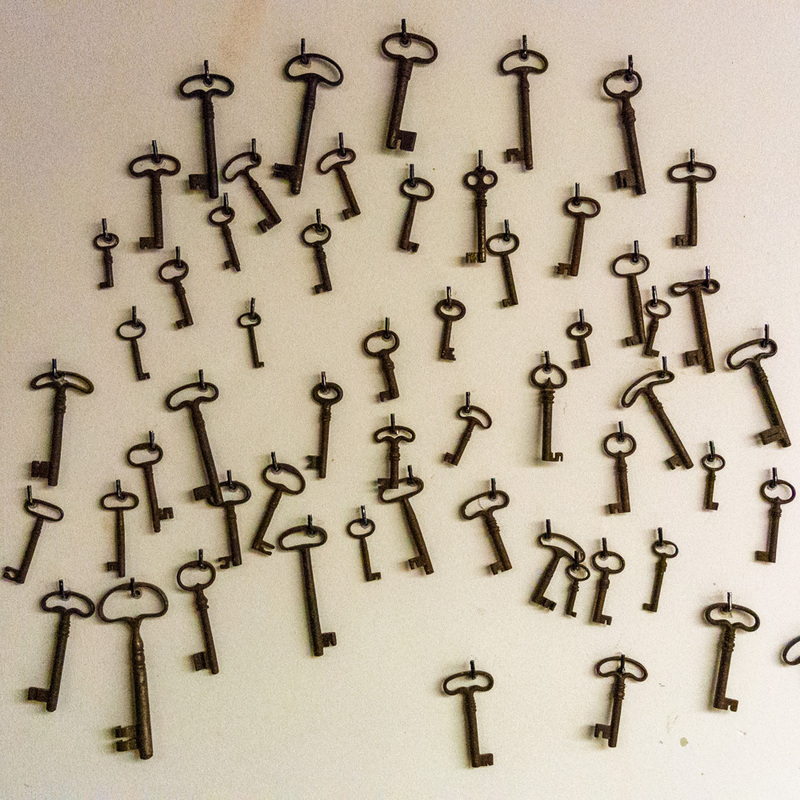 Today’s blog entry is a variation of an article I contributed to a relatively new Mallorca website, discovermallorca.com. Thank you for permitting me the use of some of that information, here. The photo (top) was taken near Campos, Mallorca, Baleares, Spain. The date: February 5th, 2012. The time was 12:10:56. The photo (bottom) was borrowed from the Internet, courtesy of diariodemallorca.es and the photographer, Miquel Massuti. I remember seeing this in 1970 in Ibiza. I was standing at the base of the old city and the Processó del Silenci there was very dramatic. I looked up and about ten feet away from me Salvadore Dali was staring at me. I passed out on the spot but someone caught me on my way down, fortunately. It was too much drama at once, I guess. thank you so much, signe, for sharing this episode. i’ve just been to the processó del silenci in felanitx on tuesday night and i thought of you and dali in ibiza. no, i did not faint.